This posting is the only one to have maintained its position in the ranking. In this posting I discuss how photo-voltaic solar panels could be used in conjunction with a Concentrated Solar Power (CSP) plant to provide relatively economical and dispatchable power. This posting climbed one spot. It describes how Post-Secondary Institutions are using Geoexchange (sometimes referred to as Geothermal) systems to provide heating and cooling to their campus buildings. In my opinion all new commercial and industrial buildings should be required to implement Geoexchange systems which use about half of the electrical power as compared to traditional HVAC systems. What if "Climate Change" is the next "Y2K"? This posting from July, 2013 is new to the "Top Ten". It might seem from the title of this blog that I don't believe that climate change is real or that it is at least partially caused by burning hydro-carbons. That is not the case. My point in this posting is that the considerable "hype" around climate change may be distracting us from focusing on the real fundamental problem – we are consuming non-renewable resources in an unsustainable way. I am concerned that should the climate change concerns cool down we would lose interest in what I believe to be the more important problem. This posting from October, 2013 discusses my experience with blogging. I am a little surprised at how fast it has surpassed much older postings. This posting has slipped from the #2 spot but still remains very popular. In it I discuss some of the opportunities and challenges facing the renewable industry in Hawaii. In many ways the Aloha State is leading the movement to a more sustainable future but I am not convinced that they are taking the optimal approach. This posting from July, 2013 is new to the "Top Ten". It is the second of a pair of postings where I speculate about developments in the renewable energy industry. Interestingly, the "Worst Case Scenario" posting is much less popular. I guess that means we are either eternally optimistic or unwilling to "face the music". This posting slipped from the #4 spot. It discusses several approaches to reducing residential energy consumption and distributed generation such as solar panels, Geoexchange, and community wind projects. I need to revise this posting soon because my views on roof-top solar panels have changed. This posting is also new to the "Top Ten". It discusses the ebb and flow of power between the utility grid and a residential roof-top solar array. It provides a link to a couple of tools that can be used to estimate the amount of battery storage needed and the net electricity generated at different latitudes. The Hawaiian Electric Company Integrated Resource Plan – Welcome to Fantasy Island! When HECO published its IRP I was surprised at how unrealistic the assumptions and development plans were. I reference an independent consultant's report that takes issue with the almost exclusive focus on computer-generated models of supply and demand. As far as I am concerned this plan is not realistic. This is my Christmas blog posting from 2012 – it has grown steadily in popularity. Almost exactly 6 months ago The Black Swan Blog celebrated its 1st anniversary. It is about to achieve another milestone – 40,000 “reads” on the first site that I began blogging at – energyblogs.com. At the same time that I was wondering if I should acknowledge this milestone I was attending the BCNET Conference in Vancouver which had the theme “Building Value Through Collaboration”. The presentations by two of the keynote speakers made me consider the value of my blogging and how I might be able to increase that value. Jesse Hirsh made the case that traditional sources of “authority” from governments to professors to the legally recognized “professions” (i.e. doctors, lawyers, engineers, etc.) are being challenged and in many cases discarded or ignored. He suggested that we are entering an age in which a person’s expertise and their ability to influence will allow them to become a “Cognitive Authority”. And he further suggested that by identifying such “Cognitive Authorities” each of us can “tune in” to the “signal” – the useful information – that is becoming more and more difficult to separate from the cacophony of facts and opinions that we are bombarded with every day. The key message I took from Jesse’s remarks is that there is an important role and even a responsibility for those of us who express opinions on forums such as The Black Swan Blog. In order to earn the right to be considered a “Cognitive Authority” we need to provide significant value for those that choose to read the material that we post. The information should be presented with the intent to broaden the reader’s perspective and base of knowledge on the topic being discussed. There are many sides to every story and it is perfectly normal and even useful to forcefully support one point of view. But that point of view must be reasonable. In our legal system we use the concepts of “preponderance of the evidence” and “balance of probabilities” to determine the truth about a body of factual evidence. With The Black Swan Blog I mentally test the ideas I am writing about using those concepts before I publish a blog posting. The information and opinions should be original to at least some extent. I would much rather provide a link to an existing “in depth” study than simply regurgitate ideas that have been expressed previously. The ability to easily refer to other material on the Internet is perhaps the most powerful new capability available to us in the information age. In my postings I make a real effort to refer to original material wherever possible. In responding to comments from readers it is essential to be respectful in all cases and positive and supportive of comments that provide additional insights into a topic, whether or not they support the premise of the posting. However, there is also an obligation to firmly refute statements that are clearly factually incorrect or deliberately misleading. I would also not hesitate to delete any comment that belittles or is otherwise disrespectful of another participant in a discussion. Another keynote speaker at the BCNET Conference was Dr. Alec Couros, Educational Technology & Media Professor. Alec challenged the audience to truly “think different” about approaches to learning at all levels. He used the example of the Nyan Cat to demonstrate that the content of a work was insignificant compared to the creativity and innovation that the work can inspire. He also emphasized the power of Youtube and Twitter to support rapid learning and the organic creation of groups of people with shared interests. Alec urges us to move beyond the exchange of data and facts to begin “sharing our collective human experiences”. In a world where knowledge is becoming a commodity, with handheld computing devices leveling the playing field, a deeper understanding of the human experience is perhaps becoming the most important goal we can aspire to achieve. I consider myself to be a “techie” venturing dangerously close to “Nerdville” but I have to admit that I have not been a very active user of either Twitter or Youtube. Based upon the what I saw at BCNET, including a great presentation on Enterprise Social Collaboration I will be trying to make better use of these tools in the future. On a related topic I have been in discussions lately with a number of people about the urgent need for digital curators on the Internet. Within the context of a discussion thread a “Cognitive Authority” can play a role. But in the broader sense of information management there is a need to categorize, prioritize, and sort through the millions of documents, photographs, videos and other digital assets that are strewn across the Internet like the contents of a teenager’s bedroom. It is, I realize, an impossible task to complete but any efforts in this area will improve the current situation. In the academic world authors provide abstracts and in the corporate world we use “Executive Summaries”. But within the Wild, Wild West of the Internet the closest thing we have would perhaps be sites like Wikipedia. We need to do more. Having taken that position I have to examine The Black Swan Blog with a critical eye. 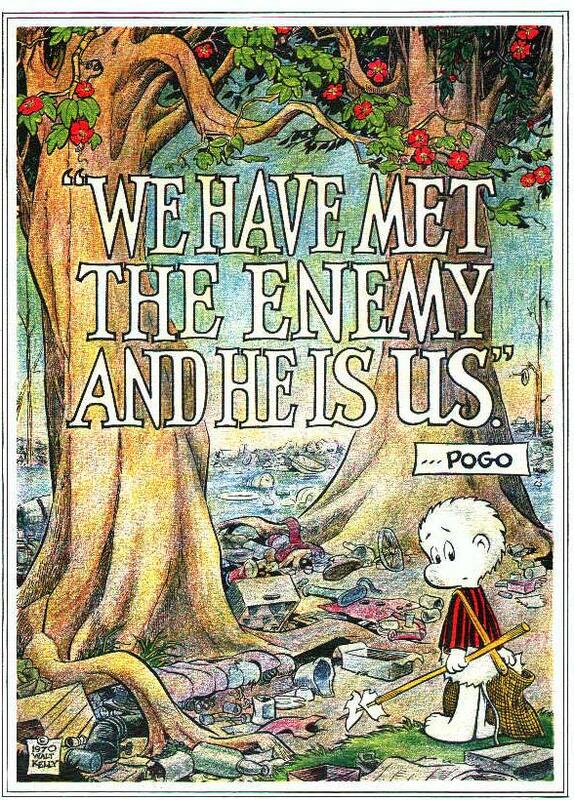 My conclusion, to paraphrase Pogo is “I have seen the enemy and he is me” .. or is it “I”? The Black Swan Blog has no table of contents and no abstracts so, as usual, I am as guilty as anyone when it comes to implementing an action plan based upon my own recommendations. But at least in this case I can remedy the problem relatively easily. So watch out for a table of contents including abstracts which should be in place within a week or two.